Fields, a 21-year-old from Maumee, Ohio, who marched with the neo-Nazi group Vanguard America before the attack, now faces a jury in the college town of 48,000 people tucked into Blue Ridge Mountains. He’s charged with first-degree murder for the death of 32-year-old paralegal Heather Heyer and multiple other counts related to people who were hit by his car that day. Fields also faces 30 federal hate crime charges stemming from the same incident in a case that could result in a death sentence if he’s convicted. Attorneys started picking jurors on Monday and the state trial, taking place in a courthouse two blocks from where Fields paused, is expected to last two to three weeks. How jurors judge the actions of Fields that day will determine if Fields will go to prison and for how long. Jason Kessler wanted “Unite the Right” to be the big event on the alt-right scene, pulling in people and groups from across the far right, including racists, neo-Nazis and white supremacists. While being a virtual unknown in the racist alt-right community, Kessler managed to draw self-described intellectual Richard Spencer, racist podcaster Michael “Enoch” Peinovich, the League of the South and even career racist, antisemite and grifter David Duke to Charlottesville. The assembly was supposed to be there to protest the removal of a statue of Confederate Gen. Robert E. Lee from a park near downtown. Attendees were promised speakers and fellowship with other like-minded extremists. Kessler’s low stature among the alt-right and questions about his ability to organize the rally caused a bit of sniping and name-calling behind the scenes among attendees and speakers. But the rally went on. Fields, whose father died five months before he was born in northern Kentucky, had expressed admiration for Nazi Germany’s leader Adolf Hitler both to school classmates and on various social media accounts. The week of the rally, federal prosecutors said, Fields decided he wanted to make the 543-mile drive from Maumee, Ohio, to Charlottesville. As he left home on August 11, 2017, a family member sent him a text urging him to be careful. For good measure, Fields attached an image of Hitler to the message. 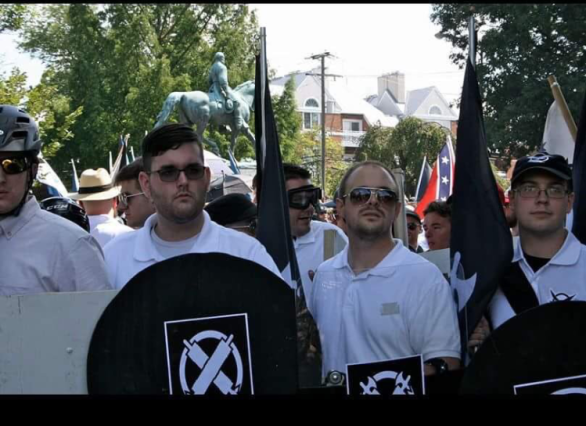 Once at the rally, witnesses and reporters spotted Fields in the park near the Lee statue, holding a shield with a symbol used by Vanguard America, a neo-Nazi hate group that helped Kessler organize the event. Vanguard America, an organization that bills itself as “the face of American fascism,” stationed members with shields near the statue. Vanguard America issued a statement not long after the rally saying Fields had linked up with them that day, but wasn’t a member of the group, that the shields were handed out to anyone interested and that the group didn’t condone Fields’ actions. Fields, members of Vanguard America and rallygoers belonging to other groups engaged chants and cheers pushing white supremacist views. Early on, the rally began to devolve into a series of fights and violent confrontations. In the morning, law enforcement declared the rally an “unlawful assembly” and required all the groups to disperse. The fighting got worse. A Maryland Ku Klux Klan leader, Richard Wilson Preston, fired off a shot into a crowd at the rally. The shot didn’t hit anyone. At a nearby parking garage, a group of white men attacked and beat DeAndre Harris, a special education instruction assistant. The attack left Harris with a cut to his head, a concussion, a knee injury, a fractured wrist and a spinal injury. As the day wound on, people set off smoke bombs, threw punches, hurled water bottles and fired off chemical sprays around downtown. In the early afternoon, Fields headed back to his car and began driving around downtown Charlottesville. Where Fields parked and where he went in the immediate aftermath of the “unlawful assembly” declaration remain unknown. But, around 1:30 p.m. that day, witnesses at a nearby restaurant spotted Fields in his 2010 Dodge Challenger near the downtown pedestrian mall at 2nd Street NW, one of two places where vehicles are allowed to drive across the walking mall. Second Street NW, a one-way street, leads a driver toward what was then known as Emancipation Park and the statue of Robert E. Lee. The next sighting of Fields came from a security camera at the Red Pump Kitchen on 4th Street NE, near East Market Street, which crosses in front of Emancipation Park. The restaurant is also just yards from where Heyer and a group of counter-protesters gathered. Charlottesville Police Detective Steven Young testified at a hearing for Fields that the camera spotted the car driving with the flow of traffic, then slowly backing up and pausing. What might he have been thinking? Fields sat, car idling at about 1:40 p.m., looking down 4th Street NE at a crowd of people who opposed the neo-Nazis and racists overrunning downtown that day. A moment later, the car accelerated at a high speed in the direction of the crowd. The car plowed into the crowd, throwing people into the air and killing Heyer. Young testified that blood and “flesh matter” could be seen in crime scene photos of the car and a water bottle from one of the victims was lodged between the hood and the windshield. After striking another car near Fourth and Water Streets, Fields fled from the scene in the damaged vehicle. A Virginia State Police helicopter video recorded his arrest a bit more than a mile away in a residential neighborhood. While some of the people arrested (and later convicted) because of their actions at “Unite the Right” have become the centerpiece of fundraising causes for the alt-right, the reception for Fields has been a bit more muted. Spencer said he wasn’t sure if Fields intentionally drove into the crowd and would withhold judgment. “I am not going to condemn this young man at this point,” Spencer told reporters at a press conference two days after the rally. Fields, for his part, has been quiet. He’s spoken only single-word answers in court to questions from a judge and did not respond to a letter from the Intelligence Project. Others, though, have sought to defend Fields. Racist podcaster Christopher Cantwell, who attended “Unite the Right,” as well as Kessler have floated a theory that Fields was being chased, so he had to accelerate across the mall to escape an attack. Conservative provocateur Ann Coulter, in an August 8, 2018 column, said Fields has “a pretty decent argument” that he feared for his life that day. Thus far, the attorneys for Fields haven’t given a hint at what his defense will be. Charlottesville Circuit Court Judge Richard Moore will preside over the trial of Fields. He’s assembled a jury pool of 360 people, who will be screened and whittled down to 12 people plus alternates to decide the fate of Fields. The trial is expected to last about three weeks. During the trial, the courthouse will be under tight security, with bags, firearms and electronics being barred from not just the courtroom, but the courthouse generally. The trial will take place at a courthouse just four blocks from where Heyer died. The site of her death is the location of a makeshift memorial. The city renamed part of the street “Honorary Heather Heyer Way.” Visitors leave messages such as “Gone But Not Forgotten” and “Heyer Love” written in chalk on the walls of the adjacent buildings and on the street and purple flowers – Heyer’s favorite color – are frequently placed on utility poles near the intersection.